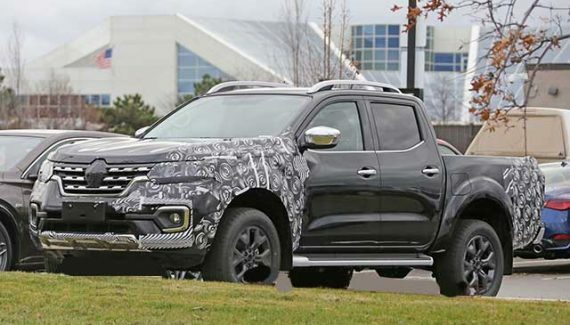 Nissan is not exactly among the top players in pickup truck segment but the Japanese automobile giant is trying hard to make its presence felt in the sector. 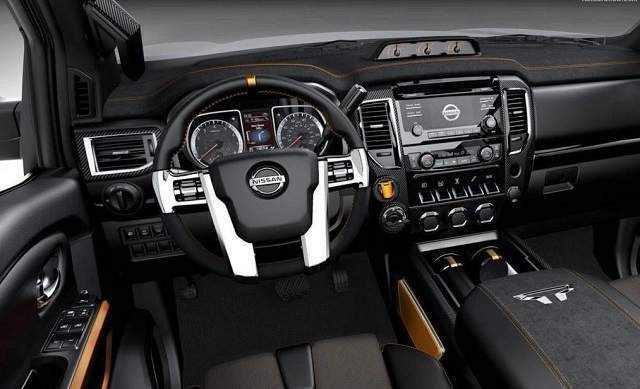 The Titan XD is a unique offering from Nissan- as it is. It is not exactly neither a light duty truck nor a proper heavy duty truck. So, you cannot exactly compare it with vehicles like Ram 2500 or Ford F-250 lineup. The 2019 Nissan Titan XD is being prepared for launch and it comes with minimal changes, and some new technologies. The 2019 Nissan Titan XD looks attractive and the styling is aerodynamic. It looks rugged as well. The grille, lamps and bumpers have been altered slightly for 2019. Three body styles are available- King cab, single cab and crew cab. There are S, SV, SL, Pro-4X and Platinum reserve. It is sold in a few exciting colors. The cabin has also been revamped for 2019. The dashboards layout is sleeker and streamlined than the predecessor. There are enough provisions to store small items in the cabin including bottles and gadgets etc. The center console can be used to store a laptop. The famous “zero gravity” seats are really comfortable even for long trips. You can opt for water repellant fabric. 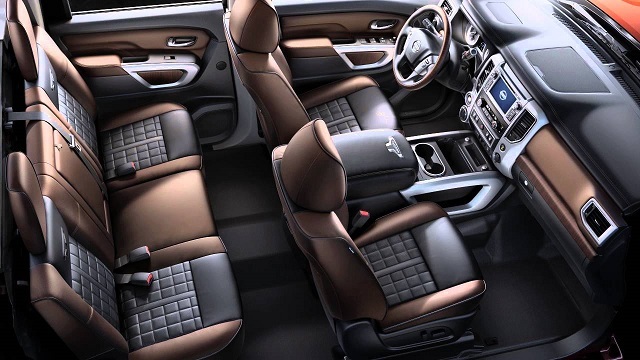 Top trims come with perforated leather seats, two-tone leather and wood trim in cabin. The 2019 Nissan Titan XD is powered by a mighty Cummins Turbo Diesel 5.0-liter engine and that makes an output of 310 hp. It is clubbed with a Aisin 6-speed automatic gearbox. A 5.6-liter V-8 engine is also available and that gets paired with a new 7-speed automatic gearbox, making 390 hp. Off-road capabilities include hill-start assist and hill-descent control. You can go for additional towing aids. It has decent towing capabilities. In terms of safety, the 2019 Titan XD scores well and amenity wise, it is a good choice to. As expected, the top trims get the best of both. All trims get Bluetooth, USB, rearview camera, 17-in alloy wheels, and keyless entry. The PRO-4X trim adds 18-in alloy wheels, skid plates, LED lighting. SL and Platinum Reserve trims get Rockford Fosgate audio system, remote start, parking sensors and larger wheels. The included NissanConnect infotainment setup is an average performer. The UI is sleek and touch response is good but it cannot match the excellence and versatility of rival setups used in FCA and Ford models. You get fewer USB ports than rivals. Only crew cab models get a 120-volt outlet. The Midnight Edition “blackout” package sets the Nissan Titan XD apart. It gets Body-colored grille, mirrors, door handles, dark headlights, black 20-inch alloy wheels etc. Plenty of customizations are available. The Platinum Reserve trim can be laden with a rear entertainment system. The advanced technology assistance systems include rear parking sensors, rear view camera and blind-spot monitor. 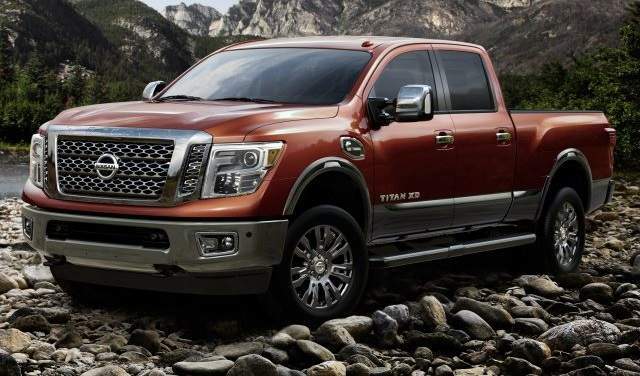 The expected base trim price of Nissan Titan XD 2019 is approx $33,000. It will be unveiled in late 2018 for sale.